Behringer - Andertons Music Co.
From rackmount compressors to mixing desks, PA systems and even analogue synthesizers. Behringer has all the essential audio equipment you need without the hefty pricetag! Behringer has built its reputation on offering cash strapped musicians value for money; providing an affordable and reliable alternative for essential studio and live gear. 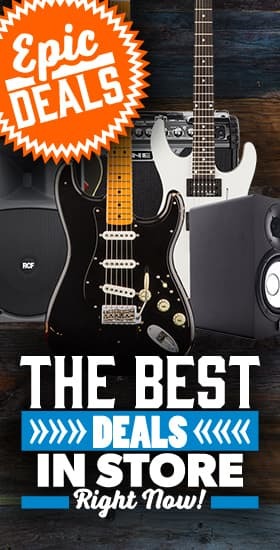 Their mantra “double the features at half the price” helped them build a massively successful range of music gear that catered to the burgeoning home studio market. The Company was founded in 1982 by Uli Behringer; a music and sound engineering graduate from Switzerland. By the age of 16 he had constructed his first synthesizer called the UB-1, however his first major breakthrough was the Studio Exciter Type F in 1988. Studio Exciters were notoriously expensive at the time and the circuitry was a closely guarded secret. Behringer managed to recreate the same effect in his Studio exciter, but he also made it much more affordable. His Type F hardware showed that professional audio processing wasn’t just reserved for the top end recording studios; and opened the market to a much wider audience. It was from these small beginnings that the whole Behringer ethos was born. Professional, rugged hardware that anyone can afford. Behringer has since expanded from studio outboard, adding a full range of studio and live gear, backline and Synthesizers. Here at Andertons, we've focused our offering on some of Behringer's most popular gear in the music community. These products have caused a real buzz in the industry, and really show Behringer at its best in quality, feature set and value for money. The X32 range of studio desks and Live mixers offer amazing functionality at their pricepoint and are available in a number of configurations to match your personal setup. Offering Excellent build quality and pro features like full size 100mm flying faders, LCD Scribble strips and a high resolution TFT screen, the X32 mixers are easy to use and have become a relatively common feature of live venues up and down the country. It all started with a synthesizer. Yet, it's only recently that Behringer has been gaining a whole lot of momentum in the synth community. It began with the Deepmind series.The Deepmind 6 and Deepmind 12 are fully analogue synthesizers loosely based on the classic Moog Model D synth - and a fraction of the cost of most fully analogue synths on the market! Since then they've expanded their range, making a full replica of the model D module, with more and more classic synths being added to the line-up every year. Not content with just recreating the past Behringer are also designing brand new affordable synths to cater for the next generation of music makers, beginning with their Neutron desktop synth module.